Yaquina Head, Oregon's tallest lighthouse at 93 feet is located North of Newport, on the Central Oregon Coast overlooking the Pacific Ocean at Yaquina Head. Built in 1872 with over 370,000 bricks. A 1000 watt globe has replaced the original oil wicks, and it now generates over 130,000 candlepower. Yaquina Head Outstanding Natural Area is the home of "Quarry Cove." The lighthouse is open daily. There are private tours available by calling the Bureau of Land Management at 541-574-3100, Monday - Friday. Fees are based per car, includes a three day pass. Call for Annual passes. The Interpretive Store and the Interpretive Center are open daily as well. The Interpretive Store phone number is 541-574-3116. Yaquina Bay Lighthouse. Yaquina Bay is listed on the National Register of Historic Places, and this lighthouse is believed to be the oldest remaining structure in Newport. Yaquina Bay Lighthouse is located in a state park at the north end of the Yaquina Bay Bridge just a few miles south of the taller tower of Yaquina Head. 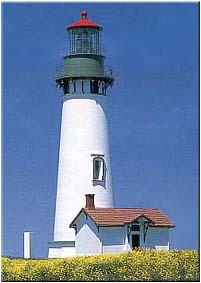 The Yaquina Bay Lighthouse was completed 1871 and stayed open for only 3 years. After along time of neglect, it has been restored beautifully and in 1996 the light was reactivated. (The original Fifth Order lens has been long gone.) In the basement area is a great gift shop. Heceta Head Lighthouse is located on the central Oregon coast, 12 miles north of Florence. The area was named after Captain Don Bruno de Heceta of the Spanish Royal Navy. He was an explorer whose expedition passed along the coast of Oregon around 1775. After nearly two years and cost of $180,000, construction of this lighthouse was completed in 1894. Bricks and cement from San Francisco, stone from the Clackamas River, and wood from Oregon mills were shipped to this site. This beautiful lighthouse can be seen over 22 miles and from the Oregon Sea Lions Caves. It is 205 feet above sea level. In order to create a flat table on this rocky cliff, it took over 1,000 barrels of blasting powder. Heceta Head State Park is located in a cove at the mouth of Cape Creek. There are picnic tables fantastic views the ocean. A nice trail leads to the lighthouse and the lighthousekeeper's house. A view of the coast north to Cape Perpetua can be seen as well. Heceta Head trail offers beach and wildlife viewing areas and is part of a 7-mile network. Sea lions, whales, wildlife refuge, gulls and other sea life can be seen from the trail, beach and cliff top lighthouse. 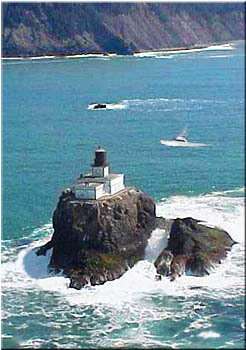 Tillamook Rock Lighthouse, on the Northern Coast began in June 1879, a lighthouse engineer boated out to the rock to determine if a lighthouse there would be feasible. Though there were monstrous seas, and a landing was impossible, the engineer decided the rock could be conquered. An intriguing and powerful testament of the will and determination of the human spirit. Knicknamed "Terrible Tilly" All materials for the lighthouse were brought by boat and hauled up the rock by derricks. The structure originally was a one-story room, 48 x 45 feet with a 32 x 28 extension for the fog signal equipment. Later a half story was added. A 16-foot square tower rising from the center of the building supports the lantern room and parapet, which housed a first-order Fresnel lens (no longer In). After a total of 525 days of labor, the lighthouse was lit for the first time on January 21, 1881. The light shown 133 feet above the sea with a signature of a white flash every five seconds. Terrible Tilly shone her light for 77 years. On September 1, 1957, Keeper Oswald Allik turned off the light. The structure was gutted and turned into the Eternity at Sea Columbarium. For more info Call 1-800-551-6949. 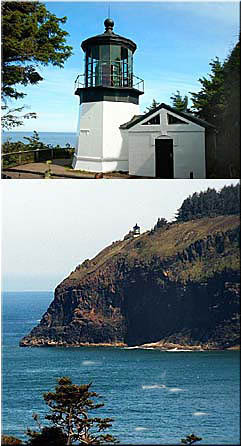 Cape Meares Lighthouse is located atop a 217 foot cliff on the northern oregon coast. Originally named Cape Lookout by explorer Captain John Meares in 1788, Originally, Cape Meares was named Cape Lookout by explorer Captain John Meares, then renamed. Construction of the lighthouse began in 1888. 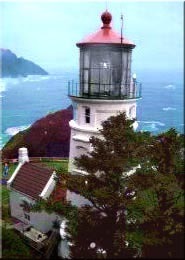 The first-order Fresnel lens was shipped from France around Cape Horn to Cape Meares. A hand-operated crane made from local spruce trees was used to lift the crates containing the prisms of the one-ton lens up the 200 foot cliff to the tower. The tower is made of sheet iron lined with bricks, the only one of its kind on the Oregon coast. The light was lit for the first time on January 1, 1890. Though the squatty lighthouse was only 38 feet tall, located on a 217-foot cliff, it could be seen for 21 miles. The lightstation consisted of the tower and two oil houses. In 1895 a workroom abutting the tower was added. Electricity came to the lighthouse in 1934, and the two oil houses were dismantled. The lighthouse was decommissioned in 1963 when an automated beacon was installed on a concrete blockhouse a few feet from the tower. The new light can be seen 25 miles at sea. Umpqua River Lighthouse is located in Douglas County on the southern oregon coast. Construction began in 1856, local Indians, who for centuries had used the area as a prime hunting and fishing ground were none too pleased to watch the progress. On October 10, 1857, Keeper Fayette Crosby lit the third-order Fresnel lens, the first light along the Oregon Coast. The lighthouse was similar to others built at the time, a large Cape Cod duplex with a tower rising from the gabled roof, 92 feet above ground. Unfortunately, the survey crew never saw the site at flood stage, or the location may have been different. Winter storms brought swollen river banks and crashing seas. The lighthouse, built on sand, was constantly battered. A coastal gale, on February 8, 1861, along with a record mountain run off, combined to blast away at the foundation. The foundation was eroded and the house and tower tilted slightly. Another violent storm in October 1863 added even more to the damage. Later, the tower came crashing down. Cape Arago Lighthouse is located in Coos Bay on the Southern Oregon coast. The prominent headland lies just south of the entrance to boomerang-shaped Coos Bay, where a rapidly developing lumber business had transformed the region into a bustling shipping center. Long before white settlers arrived in 1853, the Coos Indians lived in villages near the bay, which now bears their name. Just south of Coos Bay and 2.5 miles north of Cape Arago, is a small, detached piece of land with sheer cliffs known as Chief's Island. It was on this island that the first Cape Arago Lighthouse was erected in 1866. The octagonal, wrought iron tower was capped with a lantern room housing a fourth-order Fresnel lens and was supported by spindly metal legs. Located at the northern end of the island, the tower was linked via a wooden walkway to a one-and-a-half-story wooden keeper's dwelling, constructed near the southern end of the island. Rowboats were initially used to access the island, until a low bridge to the island was constructed in 1876. However, high seas cut short the bridge's life after just two years, and the boats were a necessity once again. In 1878, a lifesaving station was established on the island, then it was moved to the mainland in 1891, where it would be more accessible. In 1889, there was construction of a more robust high bridge to link the island to the mainland. In 1896, the Cape Arago Station received several improvements. The existing light tower was encased in bricks and covered with stucco. A brick fog building housing a Daboll trumpet was constructed adjacent to the tower, and a new duplex was built for the keepers. When the fog signal had been in operation for just over ten years, erosion on the point endangered the lighthouse and fog building. A wood-frame fog signal building with an attached octagonal tower was built near the keeper's duplex. The light and fog signal began operation on July 1, 1909. 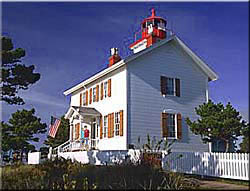 The new tower was similar in appearance to the lighthouse that had been recently constructed at Mukilteo, Washington. In 1934, the wooden lighthouse was moved a short distance to the east to serve as the keeper's office, and Cape Arago's third lighthouse was constructed nearby. Perhaps seeking a more durable structure, the new lighthouse was constructed of concrete, using the plans from Washington's Point Robinson Lighthouse. Coquille River Lighthouse is located in Coos County on the southern Oregon coast, where the Coquille River empties into the Pacific Ocean. It is adjacent to the town of Bandon. The lighthouse was a logical step for improving navigation at the river’s mouth. The lighthouse would act as both a coastal light and a harbor light. A bill authorizing its construction was passed in 1891, but it would be four years before land was purchased, plans were solidified, and the construction crew arrived on site. The workers first leveled the top of Rackleff Rock to provide a base for the lighthouse and oil house. Local stone was cut to form the structure’s foundation, while the lighthouse itself was built of brick, covered with a layer of stucco. The design was unique with a cylindrical tower attached to the east side of an elongated, octagonal room, which housed the fog signal equipment and had a large trumpet protruding from its western wall. A long, wooden walkway connected the lighthouse to the keepers’ dwelling, 650 feet away. The dwelling was a one-and-one-half story duplex, and a barn was located 150 feet beyond the dwelling. The fourth-order Fresnel lens was first shown from the tower on February 29, 1896. A snowstorm settled in the next day, necessitating the first use of the fog signal. Cape Blanco Lighthouse is located near Port Orford, on the southern Oregon coast in Curry County. Before construction of the lighthouse, the cape was covered with a spruce forest. The trees had to be felled to prevent obstruction of the light. Since the lighthouse was far from any harbor, its primary function was to warn ships away from the reefs, which extended from the cape, and to provide a position fix for navigators. The light from a powerful first-order Fresnel lens with a fixed, white signature served this function well. James Langlois and James Hughes served the longest terms as keepers at Cape Blanco, and during most of their terms they served together. By the late 1890s, Hughes had two children and Langlois five. The duplex was becoming crowded. The inspector requested the construction of an additional dwelling at the cape, but it took almost ten years of requests before the new dwelling was completed in 1908. Around 1910, a hood was placed around the lamp, and a clockwork mechanism was used to raise and lower the hood to produce a flashing signature. Between 1896 and 1916, more than 4,0000 visitors signed the guest book. In 1936, the original lens was replaced by a slightly smaller revolving lens with eight bullseyes. The new lens was rotated by an electric motor, powered by a generator. The motor and lens are still operating in the tower today. In 1980, the lighthouse was automated. Twelve years later, two local teenagers broke into the lighthouse and with a sledgehammer smashed one of the lens' bullseyes and six smaller prisms. The boys were eventually apprehended and convicted. After a nation-wide search, Larry Hardin of Hardin Optical Company in nearby Bandon was selected to repair the lens. By the spring of 1994, the lens had been repaired using Corning Pyrex, at a cost of $80,000.